Lined by towering trees on both sides, the Lodhi Road in New Delhi is a boulevard that can compete with the Champs-Élysées in Paris for its striking beauty. If the Parisian street, considered the most beautiful avenue in the world, has an entire shopping district on its both sides, the Lodhi Road, part of the Lutyens Zone, has the famous Lodi Gardens and several cultural institutions. The road begins from Safdarjung’s Tomb, a major tourist attraction, and ends at the Humayun’s tomb, a UNESCO World Heritage Site. Even with all these imposing features, the Lodhi Road remains an eyesore on the Indian capital’s traffic scheme. The reason: encroachment of pavement by a number of cultural institutions for parking vehicles, making the avenue dangerous for walkers at some stretches. A massive power generator vehicle sits on the broad pavement in front of one the erring institutions, completely blocking any pedestrian movement. The generator vehicle is parked on the pavement amid several other vehicles. “Yes, it is illegal to park on the pavement. But there is nothing we can do to stop it,” says a police officer on duty on the stretch. 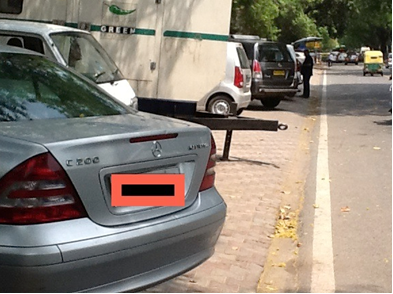 In front of another building complex, cars are parked on the pavement though there is sufficient space by the roadside for legally parking vehicles. “We pedestrians are forced to use the road risking our lives from the speeding vehicles because of the encroachment of the pavement,” says Prabhat Kumar, who studies in one of the educational institutions in the vicinity. Are the institutions listening?